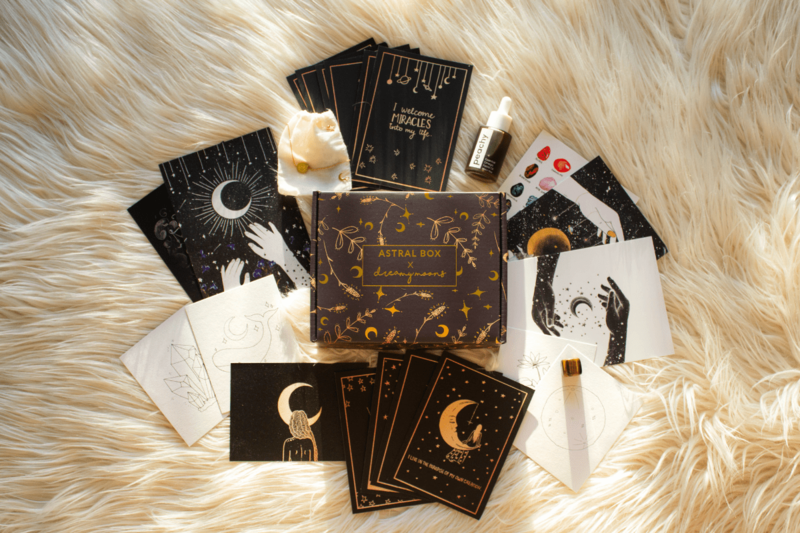 Whether you're a Spiritual Babe or a Growing Goddess, Astral Box has all the tools you need for a life with more meaning, and daily magic. You are purchasing the April Astral Box. If you would like to Save and Subscribe to Astral Box Monthly Subscription click here. Affirmations are positive statements describing a desired emotion, situation or goal. Used for centuries in the form of mantras or prayers. They work when your subconscious mind hears your words. Each box has 10 handpicked affirmation cards from the Dreamy Moons Collection. Designed and written by Annie Tarasova. Dreamy Moon's art is inspired by the Universe. By the galaxies swirling in our souls and stardust that runs through our veins. By us. By Nature. By the connection between every living thing. By endless love within us. Each box has 5 of the most popular Dreamy Moons art prints. Designed by Annie Tarasova. These guides will brighten up your room and bring light into your life. It's your turn to relax, be free and express yourself! Use any medium you like, oils, watercolours, pencils. You are capable of beautiful things. This is a moment to shut out the world and try something new with no pressure or expectations other than to have fun and enjoy yourself. Designed by Annie Tarasova. Essential Omega is a daily facial oil. Formulated for ultra hydration, soothing inflammation and supplementation of additional vitamins, minerals and antioxidants for healthy skin. When we feel beautiful we in turn create beautiful things! Carry reminders of your divine connection with the universe during your daily life. Plated in 18k Gold, and made from sterling silver. These dainty pendants and necklace can be mixed and matched to the symbol you need most at any particular time in your life. Inside each collection there is a small card that touches on the meanings of the Moon, the Star and the Daisy. Tiger’s Eye encourages us to go outside of our comfort zone, giving us the chance to grow, change, and transform into our true selves. Tigers eye helps us to see what we usually overlook. For all the dreamers who have been restricted either by other people or your own self-doubt. It's time to be brave! On top of it’s inspiring spiritual meanings, Tigers Eye is a stunning gemstone specimen that reflects light through its golden-like-threads.